The Love My Dog Training Guide teaches dog training techniques that use positive reinforcement and rewards rather than punishment and intimidation. This greatly appeals to everyone who considers their pet as more than a piece of property they own. An instruction set to help people get started. The other version available is a customized version that can be branded with your website name and linked to your website. Your branding link would replace the "Presented by Boogie Jack" branding link shown in the screen capture above. Every person who buys your branded version from you, who also resells the ebook, will be selling your customized version—so every ebook they sell will have your link in it (unless they purchase their own customized version, but most don't). In other words, your customers who resell your version will be promoting your website with every copy they sell! Even if they do purchase a custom version, you'll still earn money from your original sale—but if they don't they'll be promoting your website so you'll make money and get free website promotion! You win either way it goes! There are over 50,000 searches each month for resale rights, master resale rights, resale rights ebooks and other similar phrases, so there's no shortage of potential customers looking for resale products like this. That's why I've started creating them for my site—I'm going where the money is! A good portion of these resale searchers just want products to sell to their mailing list or to add to their website to sell. If they wanted a customized product they'd search for private label rights. Many of them won't even read the ebook, they'll just glance at it to make sure it's not garbage and then grab the sales page and customize it with their sales link to start selling it. If some of these resellers find your ebook, and that's certainly possible, many of them may sell your branded version—the one that links to your website. Just imagine how much traffic you'd get if just a few of these guys with huge mailing lists sold your version to their subscribers. Better yet, just think how much more traffic your website could have a year or two from now as you amass an army of resellers all promoting your branded version. What if you built up 100 resellers in two years time? Don't you think 100 people can drive a whole lot more traffic to your website than you can by yourself? See the potential here? It's awesome! You can have the link go to any page on your site. If you have it linked to a page that promotes a complementary product of your own or to your review of a related affiliate product you can make even more sales or earn more affiliate commissions on the back end. Backend sales are how the big boys make the big bucks! If you give the page a non-descript name you could change the page content anytime you want to promote something new and still have it be relevent. For example, a page named special-offer.html could be used to promote or sell anything and could be changed at any time. Of course, many of your customers that simply buy the ebook to learn how to train their dog may try their hand at becoming resellers too, and most of them will probably sell your version. There are 1.5 million searches each month for "dog training" so there is no shortage of potential customers. You might think a product of this size and quality would cost you a small fortune, but you can buy the ebook without custom branding for just $17.00. The branded version is just $10.00 more. It would cost you hundreds of dollars to hire someone to write an ebook of comparable size and quality. It would cost at least a hundred dollars more for a professionally designed web page, and could cost several thousand dollars for professional copywriting. In case you missed it before, you can view the sales page and sales copy here (link will open in a new tab or window). Since the ebook itself sells for $17.00 (minimum price to protect everyone, may not be sold for less), if you make just one sale you break even if you don't get the custom branded version—all sales after that is money in your pocket to spend as you like! If you get the branded version you'll make a profit with just your second sale. Anyone can make a couple of sales, and there's an instruction set included to help you get started. Since you're making money selling the ebook anyway, think of the free site promotion and traffic you can get from those under you as a great bonus that you don't have to do anything to earn! The core product, a 68-page, high-quality dog training manual—with or without custom branding and website link. Professionally written sales copy by a proven writer, provided in both HTML and plain text format. A professionally designed sales page with quality graphics. Use it as a mini-site or paste the code without the header and background into your own template so it matches your site. Use only the images you want. Master Resale Rights—you keep all the money from your sales whether you choose the custom branded version or the standard version. As an incentive to your potential customers to buy, you get to pass on the Master Resale Rights to them to help you make more sales, and they can do the same, right on down the line. If you order the customized version everyone under you will be promoting your website unless they order a custom version of their own. As an additional incentive for your customers to buy, a 77-page ebook of dog names is included for you to offer as a free bonus. You are free to edit the sales copy, sales page, and graphics if you like—or use your own if you can do better—as long as you don't misrepresent the product or use spam to promote it. You get all this for just $17.00 for the unbranded version—make just one sale and you break even. Make 1,000 sales and you make $17,000.00! Even if it takes a few years to make 1,000 sales, that's 17 thousand dollars you would never have otherwise. Imagine how much more traffic you'd get with an army of resellers under you. Ask any big time marketer and they'll tell you their affiliates are their best source of traffic. A branded version is like having your own affiliate army, only they'll send you traffic via the ebook rather than by email. 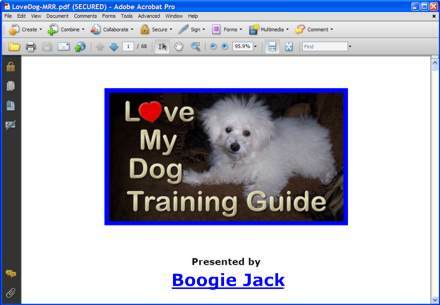 This ebook will never be outdated because dogs are dogs—training them isn't going to change. In other words, you can resell this ebook, earning money and getting more website traffic, for as long as you choose! This is a GREAT product at an EXCELLENT price in a market that's huge, hot, and evergreen. The market is here to stay, and there's plenty of room for you to get in on the action, you might as well jump in. PS - If you order the customized version, please include the name of your website (or your name, however you want the "presented by" link to read) and the full website address you want the link to point to, in the comments field on the order form.